Nottingham will mark the 30th anniversary of the Hillsborough disaster with a minute’s silence on Monday 15th April. 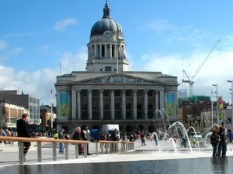 Local people are invited to join the Lord Mayor and the Sheriff of Nottingham in front of the Council House in the city’s Old Market Square for the silence at 3.06pm, the time when the 1989 FA Cup semi-final between Liverpool and Nottingham Forest was stopped. Representatives from Nottingham Forest are due to attend with Notts County also represented. Football fans are being encouraged to wear their team’s colours, whoever they support. A Book of Condolence will be available for people to sign at the Council House and the building will be lit in red and white, the team colours of both Liverpool and Nottingham Forest, on the evenings of 14th and 15th April.